Valet parking available on certain nights. I FINALLY went! I finally called and made a reservation at this Montreal institution. It was the Anthony Bourdain show called The Layover which prompted me to go. On the show, he was loving every minute, every bite and I was proud for the Montreal chef. The setting is beautiful, elegant with its more contemporary look. It was airy and spacious but welcoming. We got a beautiful table for two right by the window looking out onto to the street. We like people watching. It was a corner table so we also a great view of the whole restaurant. Let me just say that the service was refined, something we don’t see much of honestly. They were very gracious and helpful , pleasant and smiled generously. Our server’s movements seemed choreographed without stiffness or pretension. I saw it in how she changed our plates, offered our menus – a subtle hint of a bow…It was nice. As expected the sommelier visited our table and …as expected…had a vast knowledge of the wine, the origins of the grapes and how it compared to others etc… Before that though, I ordered a Martini with olives – dirty, because I thought that they must have premium bartender. I would get the best, most perfect Martini ever!! Uhh…yeah, they sure don’t skimp on alcohol lol…It was how a Martini is really supposed to be 3oz , straight up. I think other places usually make it with 2oz. I’ll stick to those from now on. I only had a quarter of my drink and put it aside right when I started getting what we call “numb-tongue”. (numb-tongue, a funny quote from the Star Trek movie) I wanted to remember my experience. I ordered the Princess scallops marinated with blueberry water, scallion oil, daikon and yuzu mousse to start. For some reason, I expected (and craved) beautiful, melt-in-your-mouth seared scallops. I was so looking forward to this. Now, I knew that at Toqué, the plates would be more “shi-shi” – Smaller portions decorated artfully. Imagine a baby new potato, split in 4 with half a basil leaf “shiffonaded” and a single coin sized “insert food here” in the center… That type of thing..So I was ready for dainty. However, when I received my plate, I was disappointed. I got 3 little half shells topped with small-diced scallop. LIKE 4 TINY squares of scallop in each shell, a little bigger than a chocolate chip, in a blueberry water. The taste was subtle, to be kind and it was exasperatingly… tiny. There were so many great sounding appetizers I could have chosen in retrospect. Why, why, why did I choose that? I could have had the BLT : Pancetta, lemon mayonnaise, parmesan cheese, basil and chardonnay vinaigrette or Chanterelle mushrooms sautéed, melted Tomme d’Elles cheese, red onion compote and sumac caramel. My husband started with Foie gras terrine, corn purée and glaze, fried quinoa, yogurt which was really great. I must say it was supreme, buttery and flavourful – excellent. He was over-the-moon about it. For my main I went safe and had the Beef tenderloin, beets, potatoes, fried leek, garlic confit, beet glaze, bordelaise sauce. I got it and Wow – the perfect tall baseball cut…with tiny, little baby beets and potatoes cut in 4 pieces and scattered sparingly on the plate. Hey, I don’t remember seeing any leek. Ah yesssss – Ghost of leek. I didn’t care though, my steak looked supreme. I like my steak medium or medium-rare but I got it so RARE! It was almost blue. It was perfect if you like your steak that way but was disappointing for me. 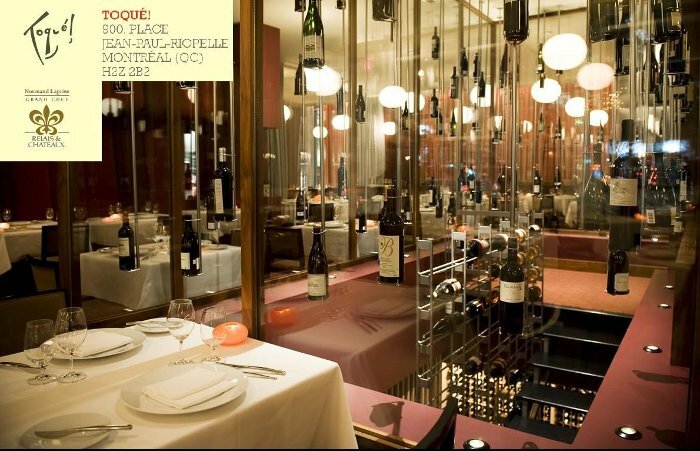 I was at Toqué, the epitome of fine dining in Montreal! This should not have happened there of all places. On the other hand, the superior quality of the meat was apparent because I cut through it easily and it was very tender. I ate it and enjoyed it anyway. Some lower quality rare steaks are hard to eat, oddly similar to a “well done” steak where you could be chewing for hours. This was not the case, but bottom line, it was not what I ordered. My husband had something new!! Yay!! Suckling pig loin and roasted belly, anise juice, red cabbage, fennel and blackberries. He really liked it but would want to try something new next time. We shared the beautifully buttery , airy and crispy mille-feuille pour deux, with petits fruits. This was excellent. All in all, I really enjoyed myself and my husband loved his food. However, I will not be begging to return but surely won’t rule it out forever. I would go back one day. My husband gives his experience a 4 out of 5 and I, a 3 out of 5. If you go, let me know how you liked it. Hi Thank you for this post! I am a carnivore par excellence, I would have sent my steak back, which I did at Moishe’s of all places!LOL I belive when you pay top dollar you should get what you order! Yes, I agree but when I had my first bite, it was good so I just ate it. It didn’t put me off much and I was having a good time.